The award-winning boutique AKARYN Hotel Group has announced the launch of the new five star, all-suite akyra Manor Hotel, opening on 1st October in Thailand’s Rose of the North, Chiang Mai. 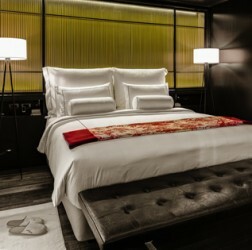 In a collaboration between the pioneering AKARYN Hotel Group and renowned Singaporean design house Manor Studio, the hotel’s design is unique to Chiang Mai. Akyra Manor has been accepted as a member of Small Luxury Hotels of the World. Led by talented design visionary Chaw Chih Wen, the bold and edgy sophistication of the 30 guest suites provide a sanctuary from the buzz of Thailand’s northern capital. The 23 akyra Deluxe suites offer a spacious 610 sq ft of living space, while seven decadent akyra Manor Suites at 1050 sq ft will give guests a stylish expanse of space to unwind. A signature of the AKARYN Hotel Group concept of ‘Outdoor Living In’, the ‘courtyard-within-a-room’ design sees a covered outdoor hot tub and indulgent bathroom as the focal point of each suite. All are equipped with the latest smart technology, naturally sourced toiletries, an espresso coffee machine and complimentary Wi-Fi. The distinctive exterior is inspired by the crumbling brickwork that forms the city’s ancient wall, hiding a hedonistic haven in the form of a hip rooftop pool bar, Rise. The cool place to be seen in downtown Chiang Mai with creative mixology and a stunning glass walled pool, guests and corporate travellers can gaze over the city sky-line. The hotel’s flagship dining experience, ITALICS, will offer a clever interpretation of contemporary Italian cuisine, created interactively in a state-of-the-art show kitchen. Embracing a SLOW food concept, guests will feast on locally-sourced and home grown ingredients with a proven provenance. Destinology offers 3 nights in a Manor Suite from just £198 per person, saving £150pp, based on two sharing on a bed & breakfast basis, and excluding flights. Book by calling 01204 821 419 or visiting www.destinology.co.uk. This offer is valid for travel until 31 October 2015.